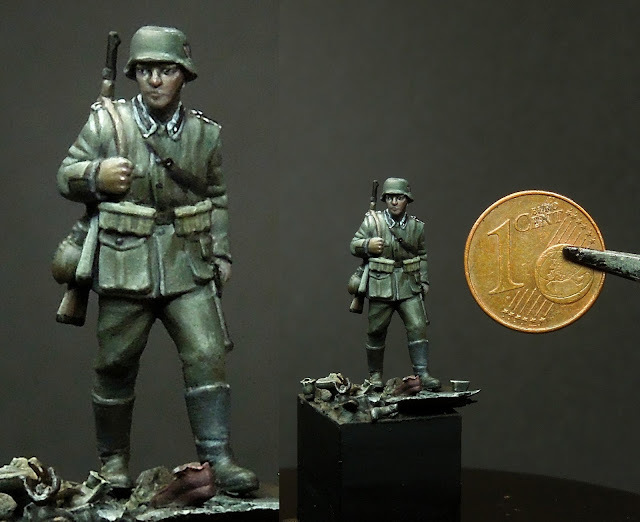 This time with a Zvezda German Soldier from World War 2. He walks by a hill of empty shoes. I hope you can spot this as this is really tiny, but I tried to tell a sad story with it. If you want to see more shots of him, follow this link to Putty&Paint. What do you think of this scene. Is the scale too small to tell stories? Hi Roman, great job on that figure, no, 1/72 isn't to small to tell a story, and you have done a great job of telling it with this figure, very impressive. Wow impressive painting on this small small fig! Moreover the storytelling is great on such a small space! Many thanks for your comments ... happy that the message can be transported even in that scale.